Surge Arrester Market size will surpass USD 2 Billion by 2025, as reported in the latest study by Global Market Insights, Inc. Rapid industrialization across the emerging economies along with expansion of power networks to serve the growing population will drive the surge arrester market. In addition, rising need to modernize the aging infrastructure along with efforts to reduce power failures will stimulate the systems demand. The U.S. congress in 2018, planned to conduct an evaluation of medium to long term evolution of the grid that will focus on grid architecture, planning & operating techniques and the emergence of new technologies. HV surge arrester market will grow over 6% by 2025. Enhanced penetration of these products across high voltage direct current (HVDC) lines in emerging economies will fuel the product demand. For instance, in 2017, India announced to build the longest 800 kV transmission line that will have the capacity to supply electricity to over 80 million people. Increasing adoption of Flexible AC Transmission Systems (FACTS) to substantially increase the reliability & availability of line networks coupled with enhanced measures to protect T&D equipment from overvoltages will stimulate the industry growth. Extensive upgradation of substations to enhance electrical reliability along with efforts to increase the power capacity to meet the future energy demand will boost the U.S. surge arrester market. In 2017, a substation in San Francisco pummeled by equipment failure caused massive power outage, leaving around 90,000 customers without power. Notable increase in transformer failure events on account various electrical disturbances and the absence of proper power protection devices will stimulate the adoption of these systems. Rising focus toward the development of efficient electrification systems to avoid the unnecessary flashovers will further complement the industry landscape. Increasing focus of utilities toward the redevelopment of power transmission and distribution infrastructure coupled with regulatory pressure to install energy efficient devices will drive the surge arrester market growth. For instance, the Edison Electric Institute has made an investment of around USD 21.9 billion in transmission infrastructure to make it more secure and efficient. Intermediate surge arrester market will witness growth on account of the ability to provide reliable and economical protection of medium voltage power equipment against voltage surges. Moreover, high suitability & operability in dry type transformers, URD cables and switching & sectionalizing equipment will stimulate their adoption. 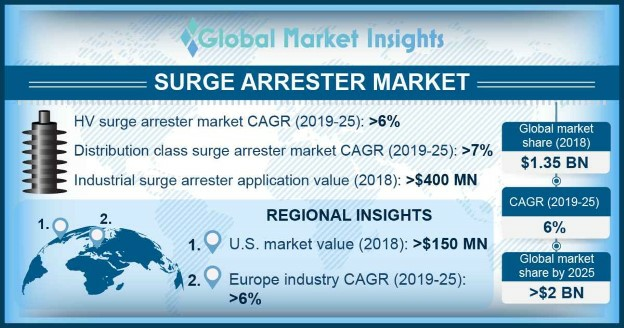 Polymer surge arrester market was valued over USD 600 million in 2018. Increasing applicability of these systems across diverse voltage ranges on account of easy installation & handling, high mechanical strength and ability to withstand high environmental stresses will stimulate the industry outlook. Notable industry participants in the surge arrester market comprise of General Electric, ABB, Siemens, Schneider Electric, Lamco, Eaton, Hubbell power systems, TE connectivity, CG Power and Industrial Solutions, DEHN, Elpro, Legrand amongst others. Ongoing advancements to develop cost-effective and energy efficient equipment have continued to be the focal point for the leading players to secure a competitive position in the market.